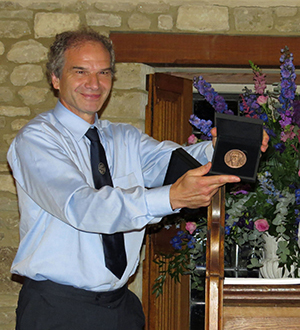 The 2014 Joseph Bramah Medal has been awarded to Professor Win Rampen, Chairman and former Managing Director of Artemis. Win was awarded the medal at the Bath/ASME Symposium on Fluid Power and Motion Control 2016 in recognition of his significant contribution to fluid power through the development of Digital Displacement Technology. Since forming Artemis in 1994 with Professor Stephen Salter, Win has been at the forefront of advanced hydraulic development and a prominent figure in the fluid power world. The Joseph Bramah Fund was established in 1968 at the instigation of Mr Frank Towler, a Fellow of the Institution of Mechanical Engineers, who arranged for its support by industry to commemorate Joseph Bramah, the inventor of a patent lock, the hydraulic press and other inventions concerned with pumps, water supply and the production of pipes and tubes by the extrusion process.